I have a Bachelor of Fine Arts Degree from Fairleigh Dickenson University, Madison, NJ and I am a graduate of the Newark School of Fine & Industrial Arts in Newark, NJ. I have worked in various advertising agencies in NJ, NY, NV, and NC since graduating and have done quite a bit of freelance work. My time now is devoted to my ceramics studio, Mad Ceramics, and teaching ceramics at Ellis Park in Spencer NC. We purchased the studio in September of 1989 after returning from England where my husband had been stationed in the Air Force. Jeff, my husband makes our slip and I do most of the pouring, cleaning, firing, painting and teaching. I have authored over 40 articles for various ceramic industry magazines including: Ceramics, Popular Ceramics, Ceramic Arts & Crafts, and Fired Arts & Crafts, and have had four of my articles appear on the covers. I have also won numerous awards in Ceramic Competitions in NJ, UK, NC and SC, including 5 "Peggy's", the "Master's" award in June of 2011 and 2013, the Colors for Earth "Brushstroke Award" June, 2012 And the "olors For Earth Award" for the best use of their products in 2013. I have always loved horses and took the first step in creating this web site: Horseramics, in England when I painted my first horse plate in 1984. I have been custom painting horses ever since. I have recently been commissioned to paint cats & dogs and decided to include all pets and companion animals in my product line, see the Photo Gallery. We have two horses, a Friesian Sport Horse, and a Kentucky Mountain Horse, four cats along with a bunch of chickens! We love to trail ride and I have learned how to "Drive" our Friesian mare. We entered our first competition October, 2005 at Oak Hill in Lexington, VA and she won Reserve Champion her first time showing and only three years old! I've got the show bug bad now! 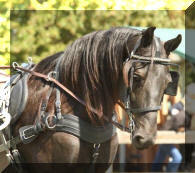 September 2007 she won Champion Driving Horse at the CCC Show in Tryon. In 2009 she won Reserve Champion Obstacles and in 2010 she won Champion Obstacles. At the present time I am very involved (Secretary/Newsletter editor) with a driving club in our area called Whips and Wheels Driving Club. I am also on the Board of Directors of Sauratown Trails Association, a group that has worked with landowners in Stokes and Surry counties NC to create a 32 mile long trail on private land that connects two state parks, Pilot Mountain and Hanging Rock State Parks.